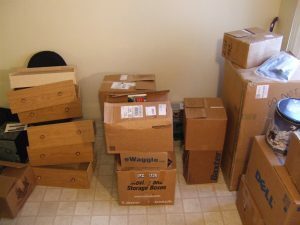 When you are relocating on a budget and need to save every dollar possible, there are some easy ways to get free moving boxes. No need to go buy new ones (which can easily cost you $50 or more depending on how big your house is). It's a good idea to start saving boxes about 6 months before your move so you don't have to scramble at the last minute to get some. Where Can I Get Free Boxes For My Move?? There are quite a few places around you where you can score some free boxes for packing up your belongings. A good place to start would be your favorite grocery store where you shop for your food. Most everything they put on the shelves had to be shipped in a box, and those empty boxes are just sitting in the back waiting to be recycled or tossed. Ask someone at the customer service counter, or find an employee that isn't busy (they are more likely to help with this if they aren't working on a pressing task! ), if they have any they can grab for you to have. This can work well for almost any business you frequent. Think about any retail store you frequent (Target, Walmart, K-Mart, Sams Club, Costco etc) as they all have tons of boxes in the back! Just make sure that any boxes you get are in good enough shape to keep your possessions intact. If in doubt, reinforce with some good packing tape. other holidays where gifts are given are a great time to collect empty boxes. As long as they are in good shape, grab any size empty ones you can get as you will find a need for all different shapes and sizes. Ask your friends, family, neighbors and co-workers for any extra boxes they have as well. Chances are you will end up with plenty of them to get all your stuff packed up without spending any extra cash! Just ask around, and from all of us at Skyline Moving Company, we wish you happy moving.